Time for another installment in our baking adventures, and this time one of my mice decided to have a go at individual apple and blackberry crumbles - perfect mouse size. We decided to try a recipe using a 'sable pastry base' thus elevating the humble crumble into something rather special. Ideal for mouse dinner parties. The recipe is given in full at the bottom of the post. 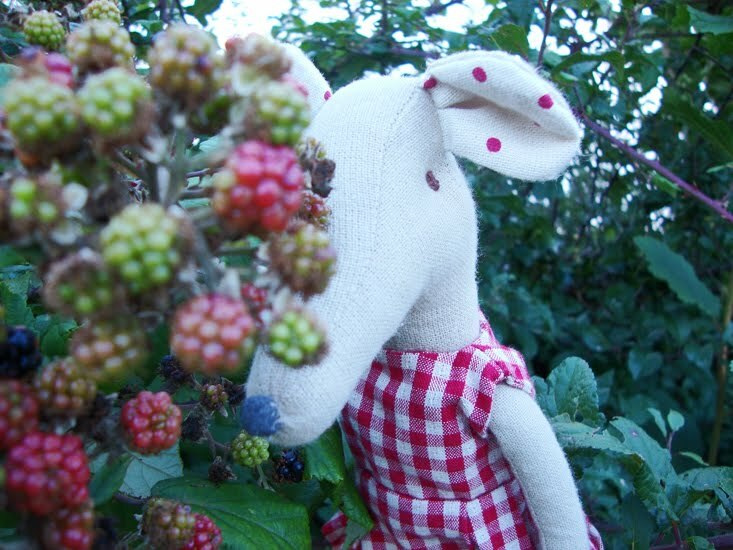 First we gathered blackberries from the hedgerows and apples from the trees Co-op, and we sauteed the fruit in a little butter until soft, then added some sugar. The sable pastry was made using icing sugar, butter, egg yolk and flour and is essentially a sweet light pastry. And the crumble has ground almonds in it... yum. It all sounds good, yes? But this is where I have to tell you that the whole thing didn't quite work. The delicate pastry was pretty sticky and it was an almighty fiddle, blind baking it in tiny tins. It kind of rose like a sponge and became a less of a pastry base than a small cake. (I am guessing this was not supposed to happen?) Anyway I'm afraid the camera was abandoned as me and the mouse battled to save the situation. I definitely want to try again - and if anyone at all fancies having a go I would LOVE to hear what happens and would gladly share your pictures and tips on here. I am certain there is a very elegant but yummy little pud in this recipe - I just haven't quite nailed it. 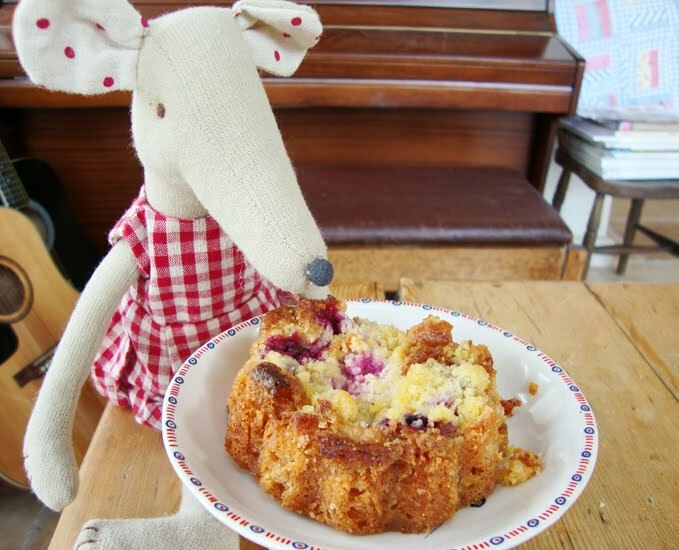 The mice loved it though and ate it up with lots of clotted cream. First, make the sable pastry. Cream the butter and sugar until light and fluffy, add egg yolk and mix well, then fold in the flour. Press the dough into a ball and pop in the fridge for a couple of hours. Meanwhile, for the filling, melt the butter in a pan, put in the apples and cook until they are soft. 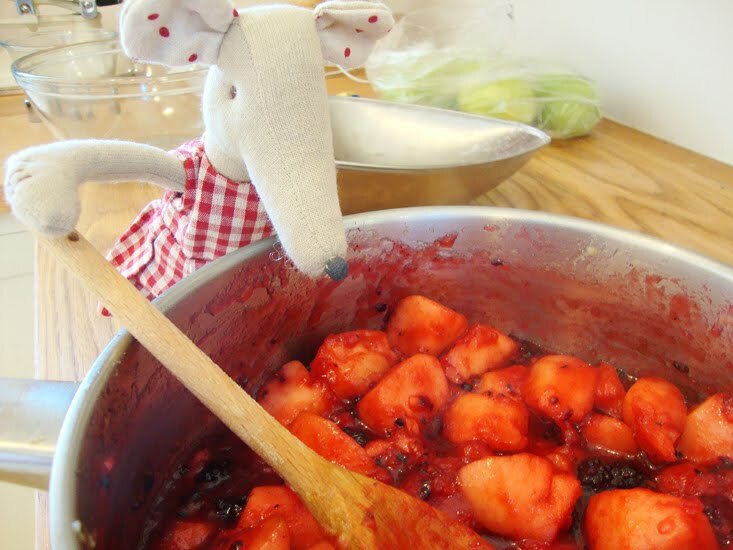 Add the blackberries and sugar, stir well until dissolved and remove from the heat. For the crumble topping, rub in flour, almonds and butter to breadcrumbs then stir in the sugar. 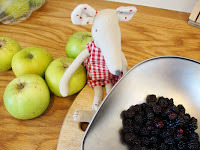 To assemble the crumble: Grease four individual tart tins (or one 16cm size if you are a very large mouse). Roll out the sable pastry on a floured surface to 5mm thick, line the tins with the pastry, trim the edges and refrigerate for 2-3 hours. Preheat the oven to 175*c / Gas mark 4. Line four individual tart tins with greaseproof paper, fill with baking beans and bake blind for 10 minutes or so until the pastry is light golden. 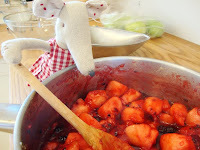 Remove the beans and the paper and fill with the apple mixture. Sprinkle the crumble over the top and bake for 20 minutes until the top is golden brown. Serve with Devonshire clotted cream. ummmm yummy & not just for mice ! Oh, I love that friendly little mouse! Did you put some greaseproof paper in the bottoms and weight it down with rice or baking beans to stop it from rising? Looks scrumptious whatever it looks like! Clotted cream, ahhhhh, how I love it, must buy some! Sarah - I tried! But this was part of the fiddle - the little tart tins were so tiny that I could only fit a tiny parchment disc and small portion of rice inside, not enough to weight it properly, maybe hence spongy pastry?!? Yum though!